If a tanker were to spill oil off the coast of British Columbia today, the federal government would not have the resources to handle a large-scale disaster, warns B.C. 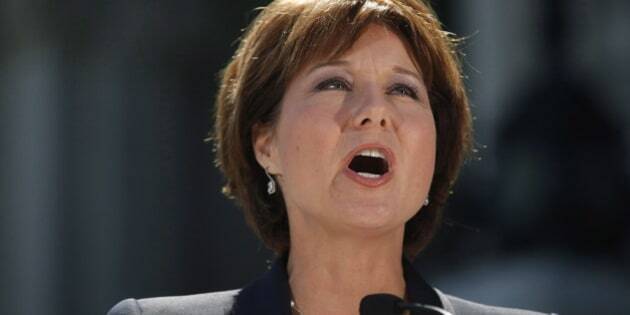 Premier Christy Clark. In an interview with CBC chief correspondent Peter Mansbridge, Clark sounded the alarm over Canada&apos;s inability to handle a major coastal oil spill now, let alone in the future should new pipelines be approved. "We are woefully under-resourced," Clark said. Her comments come amid a recent video ad campaign by Coastal First Nations in B.C. directed at Prime Minister Stephen Harper. The video shows devastating images from the Exxon Valdez oil spill off the coast of Alaska in 1989. The song by Simon & Garfunkel accompanies the dramatic pictures. The video tells viewers a similar oil spill could cost taxpayers $21.4 billion to clean up and notes that 80 per cent of British Columbians oppose oil tanker traffic in the province&apos;s coastal waters. "British Columbians have spoken. Will Stephen Harper listen?" asks the video ad campaign. Clark conceded that the federal government is taking some measures to address the danger, but "that&apos;s going to have to happen before any more heavy oil comes off the coast," the premier said. "They&apos;ve begun to look at safety on the coast and the coast guard resources, and so that&apos;s a start, that&apos;s encouraging." The federal government announced in March a number of steps to develop a world-class tanker safety system, including the creation of a panel to review Canada&apos;s current system and propose further measures to strengthen it. Clark made it clear nearly 15 months ago that "world-leading marine oil spill response, prevention and recovery systems for British Columbia" were among the conditions the federal government and the province of Alberta had to meet in exchange for her support of any pipelines running through her province. The full interview with B.C. Premier Christy Clark will be seen in an upcoming broadcast of on CBC Television and CBC News Network.